Samuel told Saul to defeat the Amalekites, destroying all life (v.3). Saul led his troops in an overwhelming victory, but he spared their king and “the best of the sheep and of the oxen and of the fattened calves and the lambs, and all that was good …” (v.9a). God informed Samuel that Saul had not obeyed and that He had thus rejected him from being king over Israel (v.10). When confronted by Samuel, Saul said, “the people spared the best of the sheep and oxen to sacrifice to the Lord your God.” (v.15). We end up deluded by our own rationalizations, offering to God sacrifices of “worship” and “service” that He neither asked for nor desires, while withholding the obedience that is distasteful to us. It is possible to live one’s Christian life amid delusions and rationalizations dressed up like sacrifice and worship, which are in fact an avoidance of the very thing Jesus commands of us. 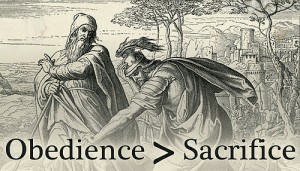 We often embrace a sacrifice whose price we are glad to pay to cover for obedience whose price we are unwilling to pay. What might such “sacrifices” include? What might we be trying to hide by making these “sacrifices”? Why do you think such “sacrifices” are so convincing? Apart from a “Samuel” pointing out the delusion of such “sacrifices” in our own lives, how might we become aware of our self-deception? Jesus’ words has strong words to say about the connection between anger and murder (Matthew 5:21-26). As I was preaching on this portion of Scripture recently it struck me how many of my illustrations related to driving. Venturing onto the roadways definitely tests our sanctification! I confess that my competitive side too often rears its ugly head when I’m on the road. 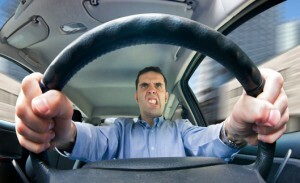 Being cut off, disrespected, disregarded, ignored, and put in danger are a driver’s frequent experience. And lets be honest, we are not always the victims. Sometimes we are the perpetrators, even if at times unwittingly. I end up praying a lot while I drive—and a not insignificant percentage of that is split between: 1) confession of sinful attitudes on my part, and 2) request for God’s blessing on a driver I naturally think otherwise about. So it got me to thinking, how can we I better see sanctification integrated into my behind-the-wheel life? As I contemplated this I considered how driving is the primary mode of transportation in our day, but walking was about the only means of transportation in Jesus’ day. And I recalled how often the New Testament uses walking as a metaphor for the unfolding of one’s life. The apostles often used this imagery to picture our Christian faith. So it got me to thinking, What if we substituted “drive” for “walk” in some of the NT’s instructions? I realize the exchange is not perfect, but a glance below will reveal that it does shed some helpful light upon our roadway routine! No, the exchange of drive for walk isn’t flawless, but it is convicting. And it gives me something to pray about (with my eyes wide open!) when I’m behind the wheel.